iStockMecca city view from Hira cave at night. It has lashed out at Canada, sometimes harshly, since Ottawa last week called for the release of jailed women’s rights activists in the kingdom. The execution came during a deepening dispute between the two countries sparked by Canada’s criticism of Saudi Arabia’s detention of activists. Canada on Friday called for Saudi Arabia to release women’s rights campaigners detained in the country, prompting a harsh response from the kingdom. Saudi-owned media has blasted Canada for arresting a Holocaust denier and other citizens. TV pundits have brought up Canada’s suicide rate in what appeared as a broadside against the country’s way of living. And Saudi media took a decidedly dark turn on Monday when it appeared to threaten Canada with a 9/11-style attack by tweeting a graphic with an image of an airliner flying toward Toronto’s skyline. Saudi Arabia has suspended new trade agreements with Canada and expelled Canada’s ambassador. It stopped medical treatment programs of Saudis in Canada and said it has made arrangements to transfer those affected. Saudi scholarship recipients at Canadian universities were ordered to other countries. Saudi Arabia’s airline suspended flights to and from Canada, potentially complicating travel plans for Canada’s Muslim population ahead of the annual Hajj pilgrimage to Mecca later this month. 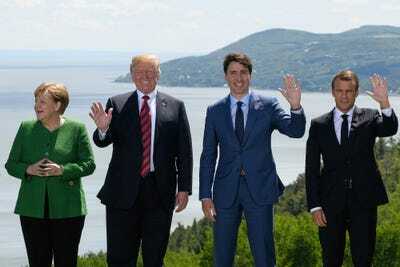 Leon Neal/Getty ImagesGerman Chancellor Angela Merkel, US President Donald Trump, Canadian Prime Minister Justin Trudeau, and French President Emmanuel Macron at the G7 summit. But the UK and the US – two countries that maintain close ties with both Ottawa and Riyadh – have remained relatively silent. The US State Department issued a vague statement calling for Saudi Arabia to respect due process and saying it would comment on the kingdom’s human-rights record in an annual report on human rights around the world. The UK, meanwhile, expressed “strong” support for human rights and said it “regularly” raises concerns with the kingdom, but it did not mention the Badawis.